Research Puzzle: TF Adlard South African Light Horse, was he a casualty? The Natal Field Force Casualty Roll (NFF) shows "416 Sgt Adlard TF Died wounds Natal 31-01-1900". Steve Watt's In Memoriam (University of Natal 2000) also shows this man with the additional information that there is a metal grave marker with his name at Mooi River and All Saints Church in Ladysmith. Adlard's QSA medal has been sold on BidorBuy.co.za, a South African eBay, for R7933 (or GBP467) as died of wounds, a screenshot of the page in NFF is shown. The information from NFF and Watt has been copied uncritically onto AngloBoerwar.com and shown as evidence by the seller. As shown clearly on the medal for sale Adlard earned bars for service after his reported death on January 31, 1900; namely Tugela Heights (February 1900), Laing's Nek (June 100), Belfast (August 1900). The medal roll makes no indication that he was wounded, died or even discharged early. Where does the NFF record come from? The NFF is a tertiary source, there is no indication of where it gets its information from. In discussions with other researchers we believe that is was compiled from casualty lists printed in newspapers. The casualty lists in newspapers come from the War Office which in turn forwards information received from South Africa; the lengthy chain of communication is open to errors creeping in. The NFF is full or errors and omissions, some are copied from the newspapers and others come from careless compilation and a lack of double checking. I use the The Times to cross check casualties. 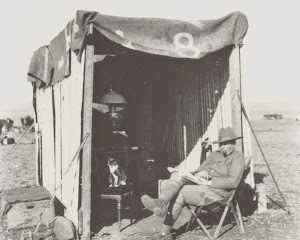 On February 2, 1900 reporting on casualties from Natal for the period January 22-27, 1900 it shows Adlard as wounded and a few lines below there is the entry: "Trooper H Adlard, South African Light Horse, died of wounds January 31". So, TF Adlard was apparently wounded - but this is not shown in the NFF, why? Who knows, perhaps they combined the two entries for Adlard on this page from the The Times (if that was their source) and recorded erroneously that TF Adlard died of wounds. "I dismounted, and was attending to the wounded Officer [de Rougemont], when some Boers rode up from the flank to within 100 yards. I gave my white handkerchief to one of the men, and told him to wave it, which he did. I told another to take the Geneva Cross armlet off my arm and hold it up, which he did. In spite of this they opened fire and shot two of us, myself and one of the men [Adlard?]." Herbert Adlard may not have been with de Rougemont but there is enough evidence to show that he was the only Adlard of the SALH to die from wounds in January 1900.